There are days when we all run out of ideas for dinner. Absolutely clueless. I have had weeknights when after work I would stare into my refrigerator till it starts to beep for the door being open too long and I am still wondering about that one question.. What the hell do I cook.. Seriously, weeknights can be quite challenging on their own, errands to run, work to go to, groceries to do, bank, the list is endless and to top it all that at 5pm you are seriously need inspiration. We all want our dinner times to be nice easy and relaxing. That is the only time P and I get to spend some quality time together at home. Our weeknights can be quite tight, from coming back home from work, to gym, to swimming, to odd grocery errand, so that sometimes leaves me with very little time to cook dinner. There are days when I actually hyperventilate at the thought of cooking dinner. I mean we do the short cuts in terms of take away etc but ideally both P and I are suckers for home cooked food . So last week was one of those manic days, It was then that this dish happened, a midway between takeaway and home cooked food. Naan Pizza, Naan, or the Indian Flat bread was store bought but the topping etc was assembled at home and cooked in the oven. Garlic – 2 cloves (finely chopped) Well I did not use Garlic since my Naan was garlic flavoured, I reckoned the Pizza would be over powered by the flavour of Garlic. You can use Garlic if your Naan is plain or you like a lot of it.. There isn’t much to do here except assemble the ingredients together really. You start by heating a saute pan at medium to high heat with about 2 tablespoons of olive oil. Add the garlic cloves if you are using it, if not add the onions and a teaspoon of sugar, this helps the onions to cook faster and at the same time help in caramelizing. Right, whilst caramelizing, you have to be attentive, you do not want the vegetables to burn or charred, so as they begin to turn golden to light brown reduce the heat. Next add the mushrooms and the balsamic vinegar, and continue to saute the vegetables until they start releasing the juice and vinegar is fully infused. Now add the salt and the pepper. A word of caution here, if you find the Balsamic vinegar tarty, add a teaspoon of sugar to balance out the taste. However, that should be the case, since we did add sugar to the olive oil. Now to assemble, On a baking sheet line the naan, I used 2 round cookie sheet. Brush the Naan evenly with olive oil. Next, if you are using sun-dried tomato paste, using a pallet or butter knife spread the paste evenly on the naan. Take the grated cheese and spread it evenly over the Naan leaving little pockets in between that helps the cheese to spread. Next now add the saute onion and mushroom and evenly distribute on the Naan breads and finish it off with some freshly ground pepper . Stick it into the oven for about 12-15 mins, should be enough to melt the cheese and crisp the sides of the naan. Finish it off by slicing the pizza in uneven shapes using a knife or pizza wheel. We ate the pizza with a yogurt dip, that I had made earlier. In case you do not like Balsamic vinegar, you can use normal vinegar and to add a little sweetness you can use 1 tablespoon of honey. Previous Post P for Patriotic and P for Pancakes.. I love this! 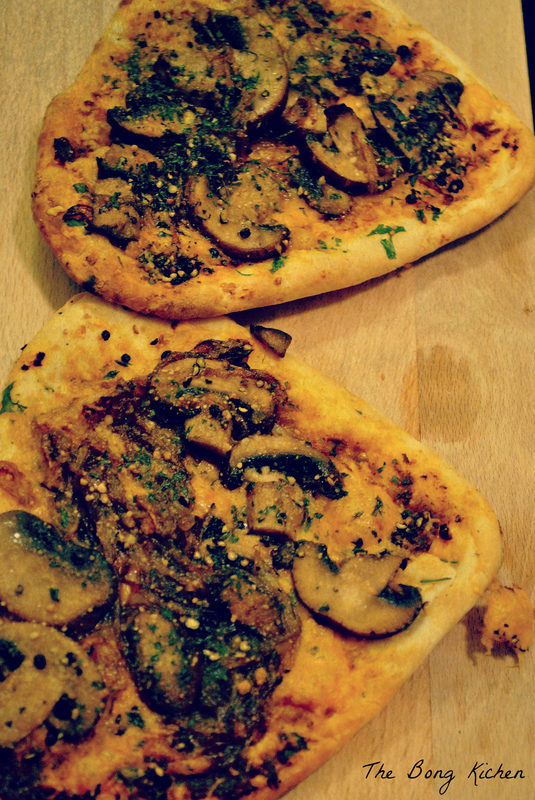 I’ve made pizzas with Naan bread also, but these look amazing. And I do love Balsamic vinegar! This is actually perfect timing for this recipe! I have some leftover naan from last night. I love me some naan so will definitely try this recipe out. There’s nothing better than a homemade pizza. Yum. Looks really good! Sounds like a yummy meal for those hectic weeknights. I’ve never tried Naan, but I like the idea! That looks really good! I made homemade pizzas just yesterday! 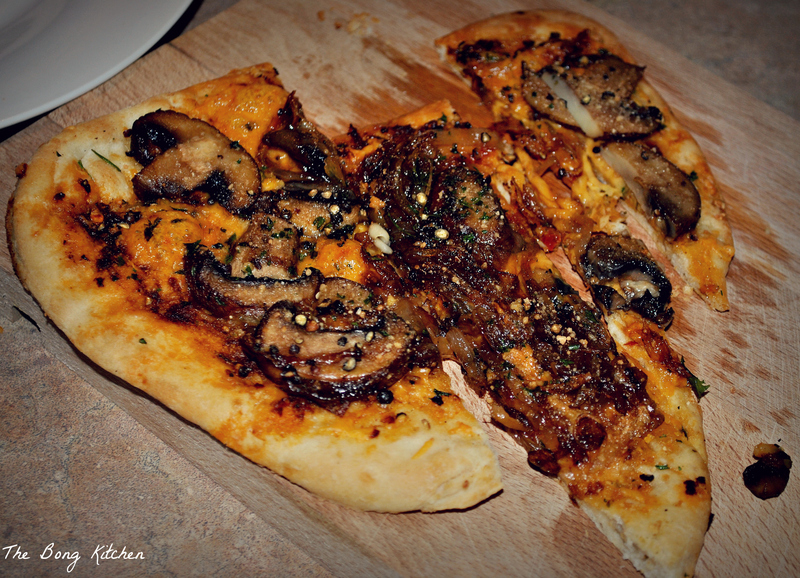 We love Naan bread, great idea to make a pizza with them! 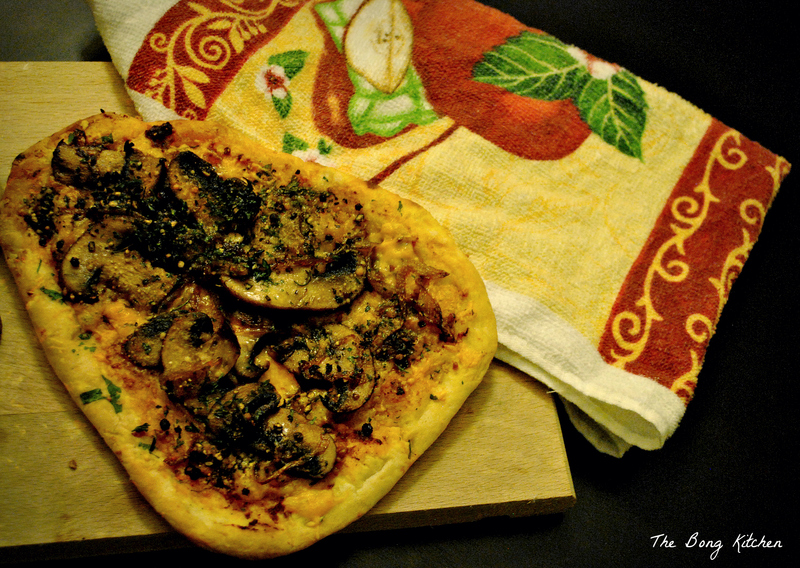 I love Naan – haven’t ever seen a pizza recipe with it, yum!